As mentioned on a previous post, I am interested in analysing if people’s ‘unhealthy’ lifestyle is associated to new cases of cancer diagnosed globally. The outcome variable I want to explore (at least for now), is the number of new cases of breast cancer in 100,000 female residents. I have this data for 173 countries from 2002, as collected by ARC (International Agency for Research on Cancer). So lets start studying breast cancer variable. Here is some univariate plots I’ve made with R studio in order to understand breast cancer spread and distribution globally. Looking at all countries, breast cancer ranges from a minimum of 3.9 new cases to a maximum of 101.1 new cases per 100,000 female residents. the distribution looks asimmetric, right-skewed, as the there is a longer right tail. This implies that the mode is less than the median which in turn is less than the mean. 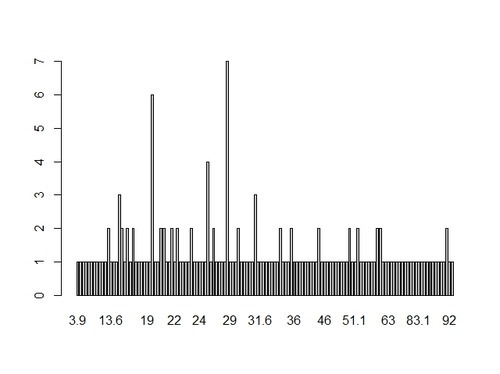 The mean is larger than both median and mode, because it is influenced by the longer right tail of the data. Note that the median is in the left half of the box and that the right whisker is longer that the right whisker, as typical for right-skewed distributions. The boxplot confirms our considerations made previously on the data. Another interesting analysis on breast cancer, might also be producing a frequency table of the data. However breast cancer values are pretty unique in each single country. Here I sort countries by breast cancer to see most/least affected. 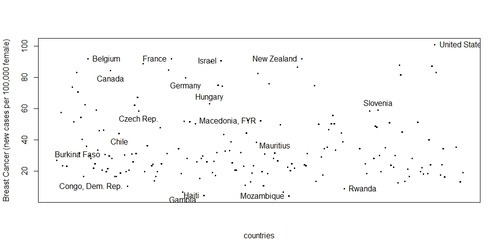 As an example, I print the top and worst 5 countries. We can also see how many countries we have in the data set for each continent. 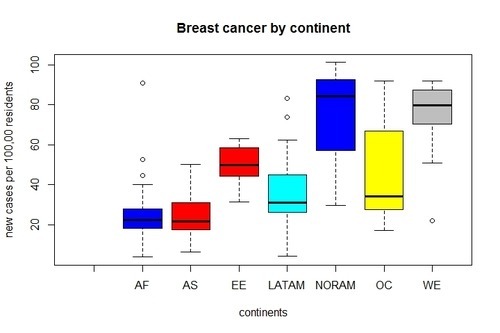 Finally lets plot breast cancer by continents. 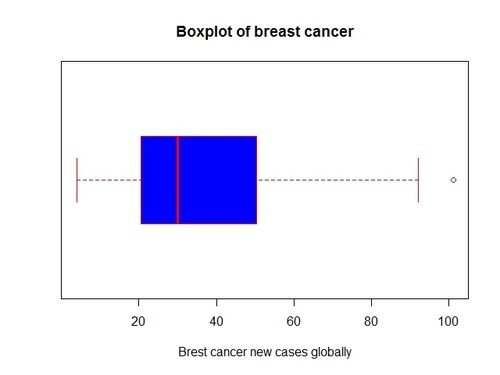 To plot relationship between a categorical variable (continent) and a quantitative variable (breast cancer), we can use boxplots. Are there significant differences between continents? Yes. It looks there are significant variations in breast cancer among continents. We can clearly see that the median of breast cancer for North America and West Europe is substantially higher than other continents. 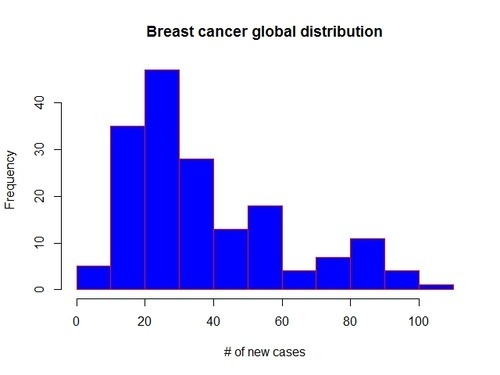 On the other hand, Africa and Asia report the lowest number of new cases of breast cancer. This let me immediately think whether there might be a positive correlation between economic development of a country (more specifically GDP per capita) and inclination to breast cancer. Are women living in rich countries more likely to contract breast cancer? To be honest, I don’t really think there is a strong direct relationship between the two variables, much less a causation. Yes, richer countries might be associated with higher cases of breast cancer detected; but at the end of the day it depends on how this wealth is spent by people… is the money spent to buy high-calorie foods or alcoholic drinks that in the long run will put your health at risk? or is it invested to manufacture goods that generate more CO2 emissions? I will definitely explore if there is any association between breast cancer and wealthy of a country, but as initially mentioned, my research question will focus on people lifestyle and specifically whether women conducting a healthy/unhealthy lifestyle are less/more likely to contract breast cancer.